I sit more than eight hours a day, 5 days a week. Office work requires you to sit in front of your computer and bang away at your keyboard. This activity is bad in so many ways. Your hip flexors becomes tight and your body posture has to compensate for it. If you see somebody with a body posture where his hips seems to bulge out, that's a sign of tight hip flexors. Sitting down too long is bad for your back too. I have a chronic backache for the past six months now. When I bend forward, my lower back feels tired. When I bend backwards, my lower back feels tired. It definitely has got to do with my daily posture. Having enough of this, I decided to take some action and looked for back support contraption. My girlfriend found one on Qoo10. It's called Magic Back Support and it helps to stretch your back. I found another that lets you attach it to your chair to provide lumbar support. I ordered both and waited for delivery. 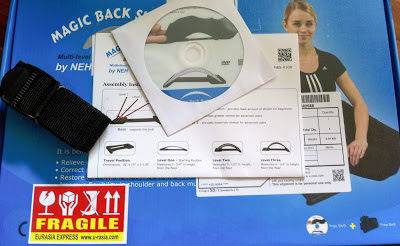 The Magic back support came first, just three days after ordering. At $22 which includes $5 for courier by Eurasia, it is reasonably priced. Opening the box, you will find two pieces of black hard plastic, an instruction sheet, a belt and a DVD. Following the instruction sheet, I proceed to assemble both plastics together. The base plate has one notch at the bottom and three notches at the top. You bend the second plastic between the top and bottom notch. Three top notches gives three different level of intensities. 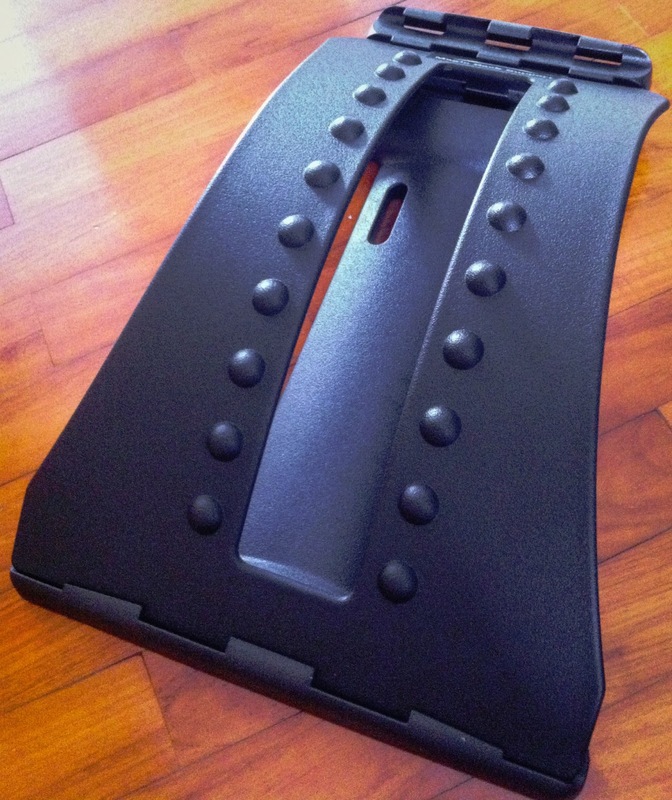 The bent plastic top has two rows of knobs which I assume to provide some massage. I started with the beginner notch. Lying on it with my bare back, the plastic was smooth and comfortable. You feel your back being caressed and it is at its natural state. You will want to rest your head on a small pillow or thick towel. The company advertises that you only need lie on this for five minutes twice a day to solve all your back problems. While I am not sure about that, this device was comfortable enough for me to lie on it for thirty minutes while using my phone. When you want to get up, the instruction was to roll over to your sides first to prevent hurting your back. Feeling adventurous, I moved up to level two. Oh boy, level two is different. Now you can really feel your back muscles being stretch. This level is probably one that a yoga student would scoff at. For me it was a stretch indeed and I do not consider being comfortable. I find that after after lying on this awhile, it's best to complement it with some forward bending stretch. You remember doing sit-and-reach in primary school? Yea, that's it. 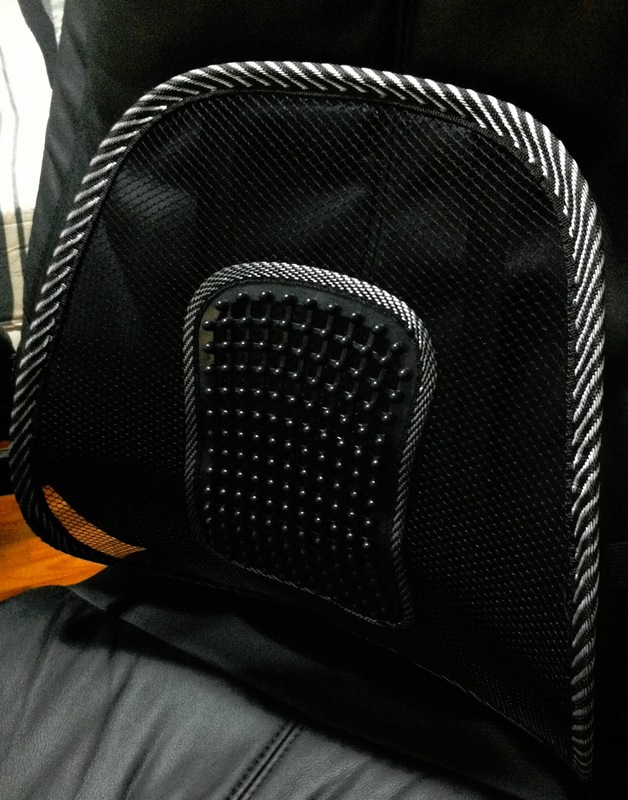 Having used it for a week now, I find that my backache is not so pronounced now. I will need to test it further and provide an update. In summary, this is a solid piece of product. The reason I say this is because this is a really thick piece of plastic and when you form an arc like this, it can take a lot of force without breaking. If you ever seen the arc structure of bridges, it obeys the same law. Furthermore, this is portable, allowing you to quickly assemble. When disassembled, it's flat and easy to store. At the price this is selling for, it won't break the bank to give it a try. You can buy it here. This item arrived 5 days later via registered mail. Unwrapping the package, the device is ready to use. I slipped onto my working chair and the black colour matches up. The shape of the netting is held up by the sturdy wireframe (wrapped in black and white stripes) and two vertical webbing at the back. The is a horizontal band that wraps around the body of the chair, keeping it in place. 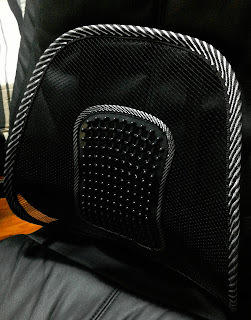 In the center of the netting, there is a patch of plastic beads that massages your back. It kind of reminds me of those beads that the old taxi uncles put on their driver seat. Lying back on the back support, you get a sense that your lumbar is being suspended so your back posture is in a curved shape. While I notice the beads poking onto my back at first, I quickly forgot about the existence of the back support and went about my work. Which is really what this device is meant to do: supporting the posture of your lumbar without getting in the way. At $4.50 including postage, it is very cheap. If you are considering to buy this, you can click here.